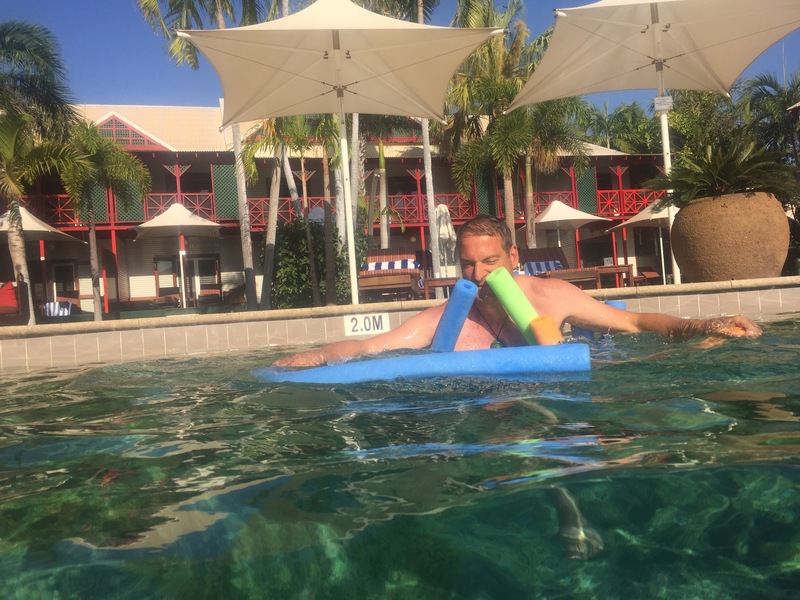 We checked into the Cable Beach Resort, and took a mere 30 minutes to streak the white towels with red dust, scatter tiny Pilbara stones from our luggage onto the floor, and appear poolside looking like we had been rehomed from under a bush. There were two pool areas, one for families, and one other, conveniently located on the edge of our room. The family pool area had funky Ku-De-ta style music and a lively vibe. Walking into our pool area was like walking into a scene from Coocoon. People draped over noodles smiled a little too brightly, bobbing slowly on the spot to an eerie silence. Those not in the pool appeared to be recovering from cosmetic surgery, with an over representation of compression bandages and overly large hats. A guy we identified as Solar Panel took up position at dawn, and rotated all day on the same lounger to face the sun, briefly moving to a particular chair in the shade to drink a beer every hour. I wanted to give the pool scene triage, and asked the terribly pleasant barman for some music. He seemed to have been swimming in the same pool, or may have been a droid as he looked blankly, before his eyes flickered, registering the request, and advising Management had told him to turn it off. The noodles resisted W’s attempts to breathe life into them. At dusk, a queue of cars formed to tear down the beach. Ok, well, W tore down the beach at a disobedient 16kph. Irikandji (a jellyfish that requires morphine to dull the pain) danced in the shallow tide, camels plodded past, and a 3m croc decided to wait another few days before having a crack at the swimmers and dogs splashing enthusiastically about. Fearful I may get attached to swaying palms in pink sunset bars, champagne in glass vessels, chlorinated swimming, mirrors, and air-conditioned rooms, W drove at breakneck speed up the Cape Leveque Peninsula, to Goombaragin, one of the many campsites offered by local leaseholders along the coast. Our campsite was one of only two, both on the cliff overlooking the bay, with a charming rocky track down to the beach that I would not recommend to the infirm. Unfortunately, wind made the water pretty murky but we were desperate. The welts from something in the water receded within 48 hours, and being led back up the path by one of the resident pythons was a bonus. Traditionally guests gather at a daily fire with the host family and fabulous tips and local history are generously shared. The 17-year old lad of the host family was an inspiration, his enthusiasm for pythons (he had a Stimson in an aquarium), fishing, diving, shells, bare feet, and his overall sunny and open nature will take him far. I would love to know where his future takes him. Hermit Crab Highway. Overnight, all footprints are eradicated by the march of tiny hermit crabs. There are a few must do’s on the Peninsula. A visit to the Hatchery at One Arm Point is a must. For a $15 fee to the community, I learnt more about local fish in that 30 minutes than I have with my multiple fish books. 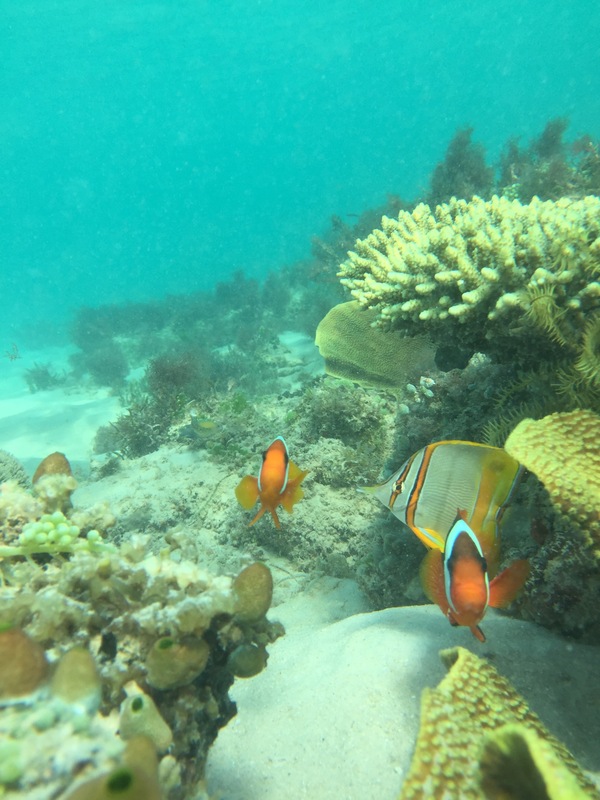 I got spat at by Archer fish and plotted to save a forlorn Barramundi Cod brought in by local kids, as it lay unmoving on the floor of the tank – this species mate for life, and pine away when they are separated. At low tide you can see Lemon sharks being herded by local dogs at the boat ramp. A visitor filmed it and the video became a phenomenon, but it happens regularly. At high tide, a phenomenal amount of water courses between offshore islands. And of course, there’s Kooljaman. 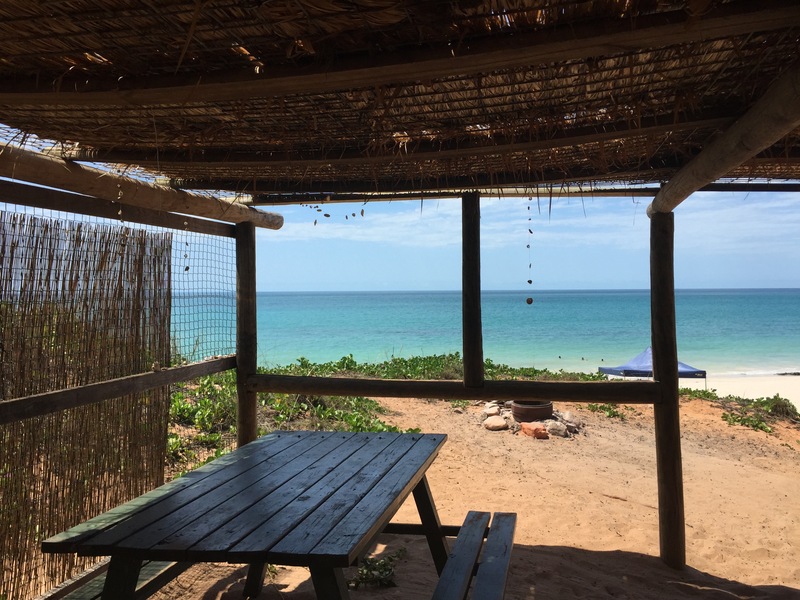 When I saw the azure beach at Kooljaman, a resort at the tip of the peninsula, around 220km north west of Broome, I booked us into the campground immediately. It had nothing to do with the adjacent resort cafe and ice cream fridge. Tour buses, float planes and helicopters swept in at regular intervals, piloted and driven by clean-cut guys in their early twenties dressed in Steve Irwin khaki’s and R M Williams boots. 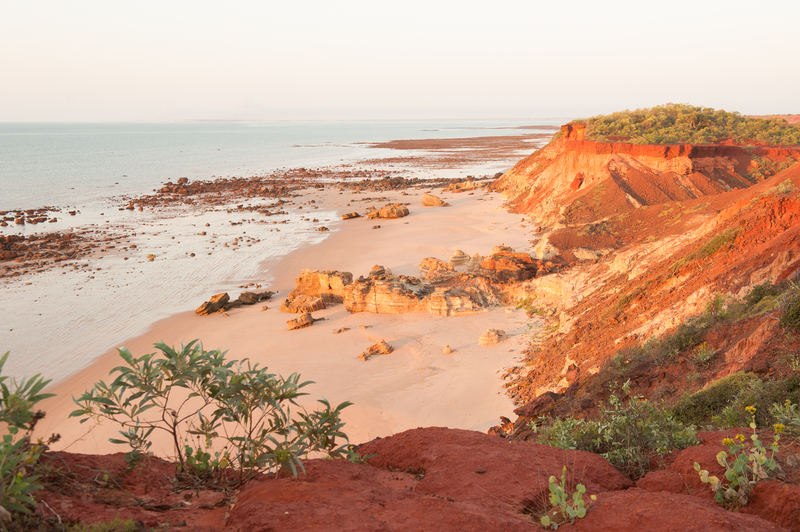 Most of the tours were a ten-hour marathon that covered both Cape Leveque and the Deeby Horizontal Falls in one day, giving a parade of people that looked remarkably similar to each other every day an outback-meets-the-ocean experience in 20-minute segments. The Outback Pilot Uniform seemed to catch on as I noted a surfeit of women my age, in flowing layered dresses (as women my age are prone to do) finished off with a pair of R M Williams boots. I haven’t discounted releasing a Boho-meets-Jillaroo Collection when I return to Perth. I find the best sights are usually in the kitchen. A global fusion breakfast crafted by a young german lad with an evidently iron-clad constitution, wins so far. Layering white bread, a hefty squeeze of chilli sauce, a smear of berry jam, and plastic cheese presumably for stability, he flew in the face of standard backpacker fare – dry chicken and corn two-minute noodles, and teeny cans of tuna. There is a meaningful statistical trend for the kind of travellers you find in campgrounds. The rougher it gets, the country of origin reduces down to three: German, Kiwi, and Australians under 40. You generally don’t see the guy in the t-shirt that reads: ‘This is Australia. We eat meat. We drink beer. And we speak f*kin English.’, anywhere that requires 4WD access. I reluctantly note another trend, and it is prompting a sense of vigilante-ism within. Each day I wish to be disproven, but alas, where Whizz-bangers (backpackers in forensically overloaded rental vans) have been, a trail of dry noodles and used disposable kitchenware appear on the bench, while cigarette butts, empty tuna cans, and egg shells pile up in the bush. PROVE ME WRONG people. While we were at Eastern Beach a group of 30 or so people of all ages gathered to enjoy a picnic under the day-use shade huts, near a shower for cleaning off sand. They had walked over the hill, carrying multiple eski’s (chully buns), and bags of food, chatting excitedly all the way. Children ran about, a ball flew back and forth, the water sparkled, and adults laughed easily, although no-one swam. One said to another, “Go ahead, you can get in there, but I’m not saving you.” I wanted to tell them I’d take them swimming! 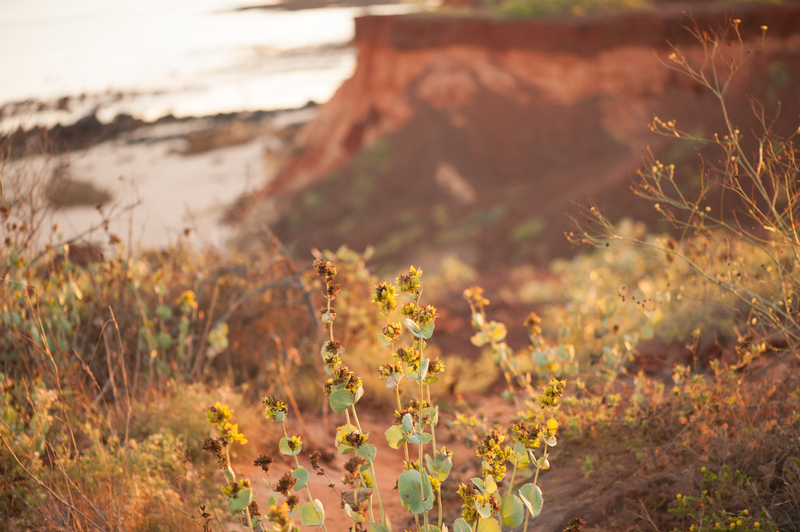 We talked to all sorts of interesting people around Cape Leveque, including a guy we discovered had killed his wife on the basis of infidelity, “but it’s ok, he did time”. We offered to show a lovely German guy the snorkelling spots and a lift over the hill (it’s about a four minute drive) and he said, “Of course you drive, you are Australian.” We covered multiple topics including the international phenomenon of pre-dawn poolside chair claim, and he said the most wanted gift at a Deutsche Bank conference he went to was a towel that read, “We have been here already”. Gold! That night a group of musicians on tour played a few numbers at Kooljaman in advance of their Ardi Reflections gig at local community, Lombadina. On the strength of the amazing sound, we went and enjoyed incredibly arresting and impassioned performances from the musicians, story tellers, and Bardi dancers from Lombadina, alongside a lot of other tourists. Sitting there being entertained felt a little colonial to me. 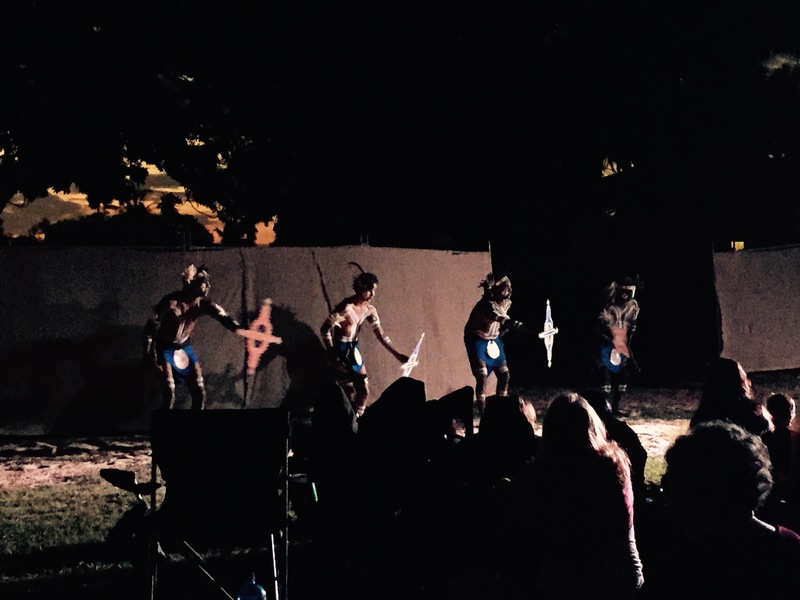 On the one hand, events like these enable communities to share their culture and provide an income stream. On the other, it somehow made history stark, that there is so much wonderful heritage still to be shared, and that we all have a long way to go. 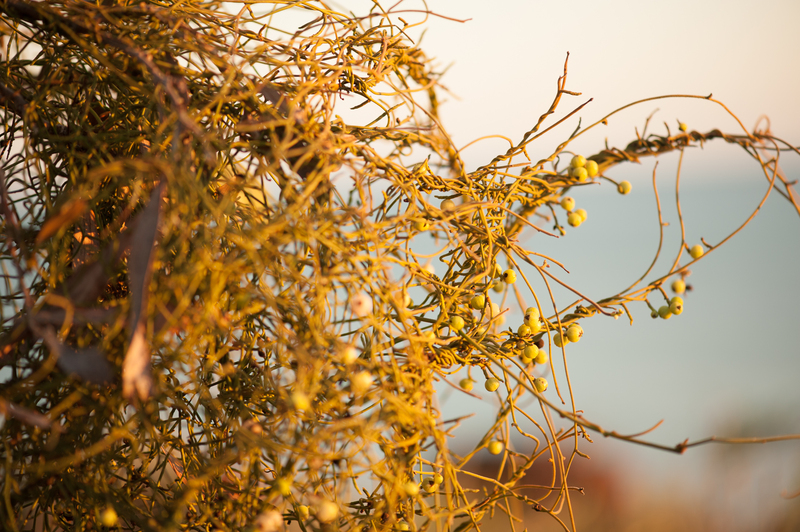 Cape Leveque vine of unknown species! 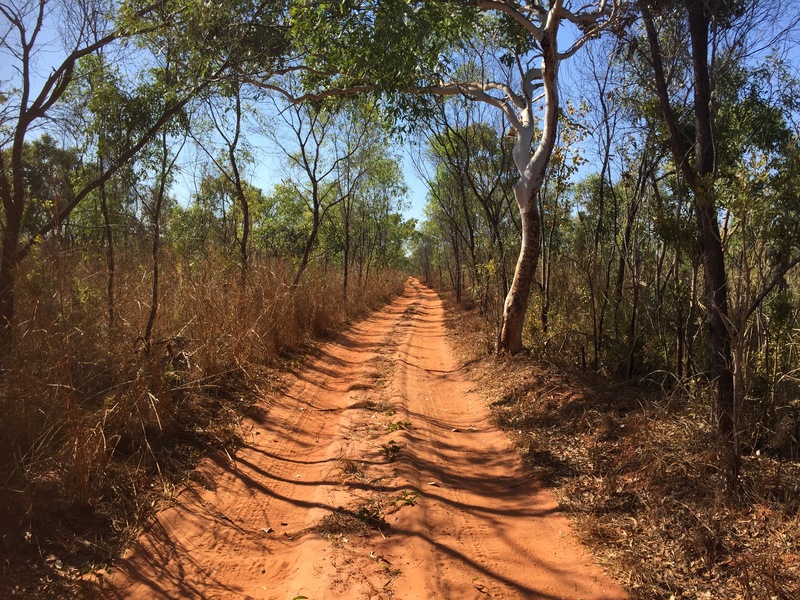 Next: Across the Top End. 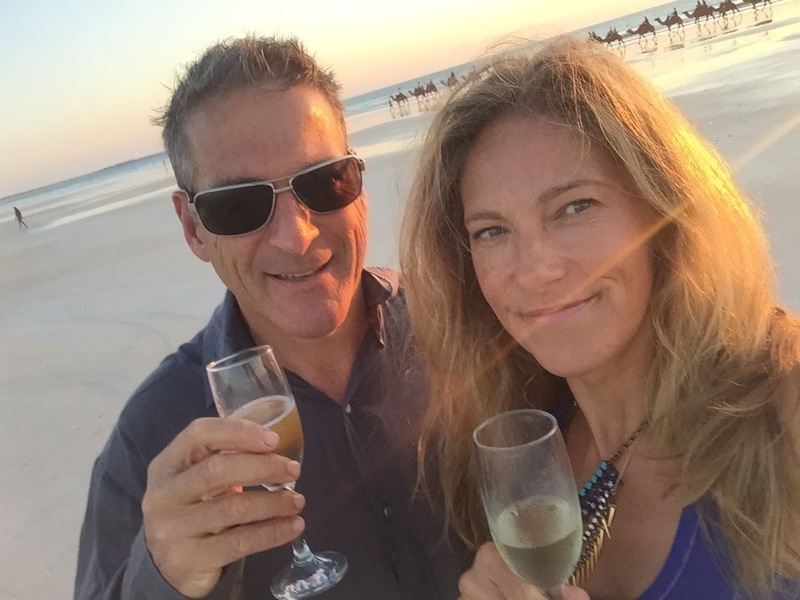 Broome (2200 km north of Perth) – Eat great tapas at 18 Degrees, $12 cocktails on Friday and Saturday from 3pm-5pm. Have mex-inspired breakfast or a fab almond croissant with Broomes best coffee at funky The Good Cartel café, that also does drive through. 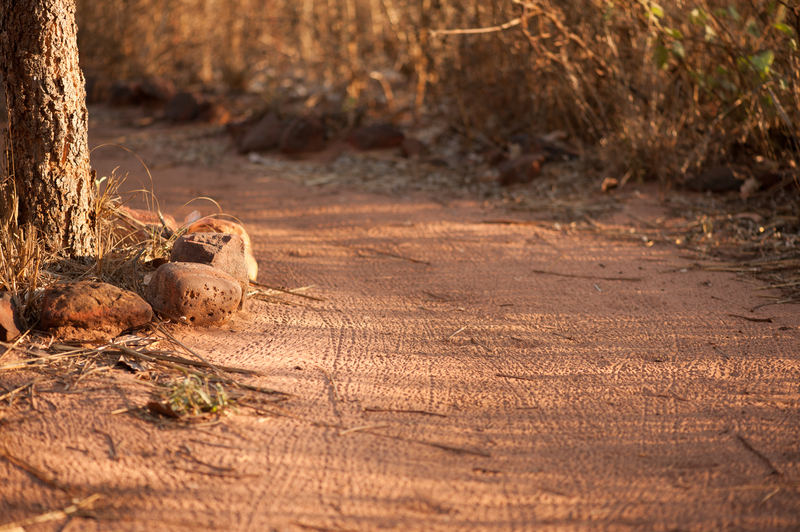 Karijini (1400 km north of Perth) – Do all of the walks, especially the spider walk, swim every day to cool down in Fern Pool, go to Phill Witt’s REMTREK Astro Tour. 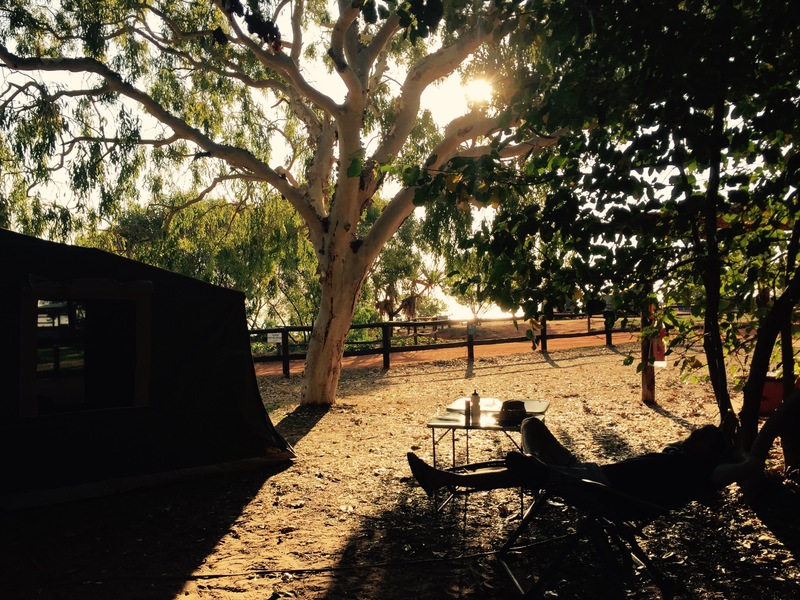 Millstream Chichester (150km east of Karratha) – Go there in May/June, get there early, and nab a campsite at Miliyanha on the outer ring, under trees. The old homestead has loads of detail about the families who lived there, and a very charming and shaded Homestead Walk. There are loads of walking tracks, and you can swim in Deep Reach pool. 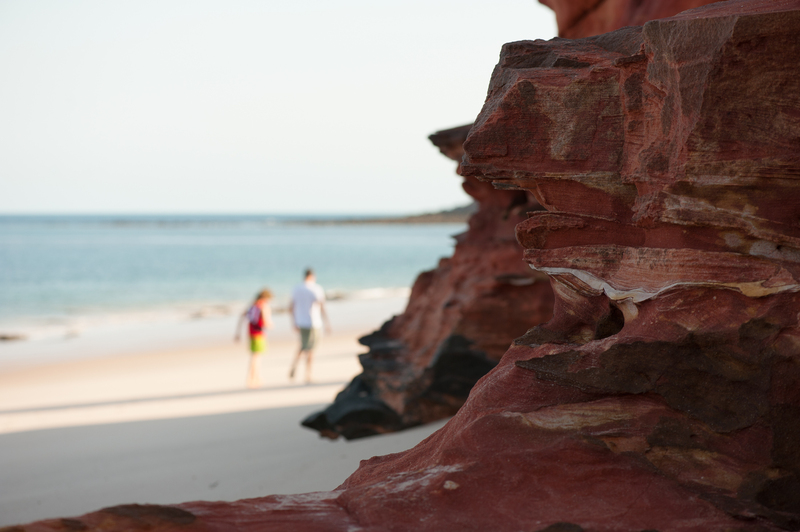 Kooljaman (220km from Broome) – stay in the beach huts (need a tent) or cabins at Eastern Beach.